Ed. by Massimiliano Sala, Teo Mora, Ludovic Perret et al. Coding theory and cryptography allow secure and reliable data transmission, which is at the heart of modern communication. Nowadays, it is hard to find an electronic device without some code inside. 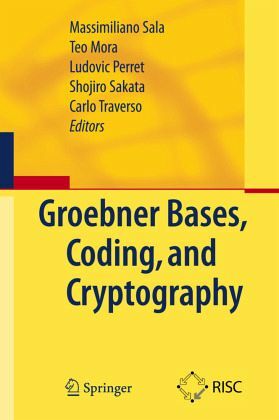 Gröbner bases have emerged as the main tool in computational algebra, permitting numerous applications, both in theoretical contexts and in practical situations. This book is the first book ever giving a comprehensive overview on the application of commutative algebra to coding theory and cryptography. For example, all important properties of algebraic/geometric coding systems (including encoding, construction, decoding, list decoding) are individually analysed, reporting all significant approaches appeared in the literature. Also, stream ciphers, PK cryptography, symmetric cryptography and Polly Cracker systems deserve each a separate chapter, where all the relevant literature is reported and compared. While many short notes hint at new exciting directions, the reader will find that all chapters fit nicely within a unified notation.